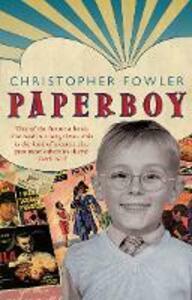 Christopher Fowler's memoir captures life in suburban London as it has rarely been seen: through the eyes of a lonely boy who spends his days between the library and the cinema, devouring novels, comics, cereal packets - anything that might reveal a story. Caught between an ever-sensible but exhausted mother and a DIY-obsessed father fighting his own demons, Christopher takes refuge in words. His parents try to understand their son's peculiar obsessions, but fast lose patience with him - and each other. The war of nerves escalates to include every member of the Fowler family, and something has to give, but does it mean that a boy must always give up his dreams for the tough lessons of real life? Beautifully written, this rich and astute evocation of a time and a place recalls a childhood at once entertainingly eccentric and endearingly ordinary.